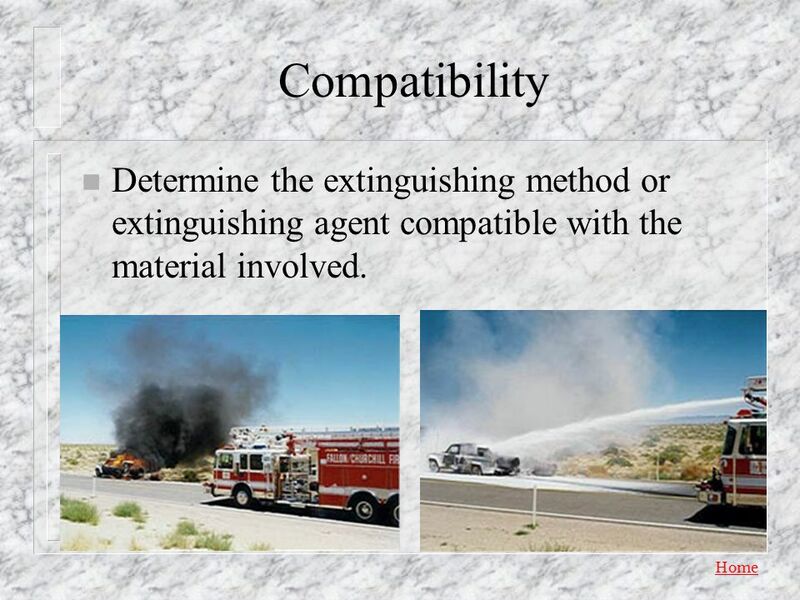 3 Compatibility Determine the extinguishing method or extinguishing agent compatible with the material involved. 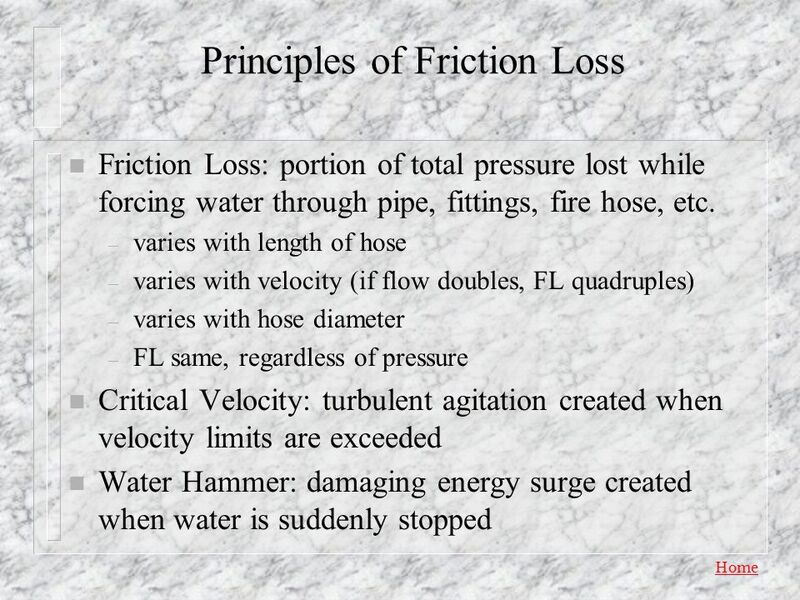 Fluid pressure is perpendicular to any surface. 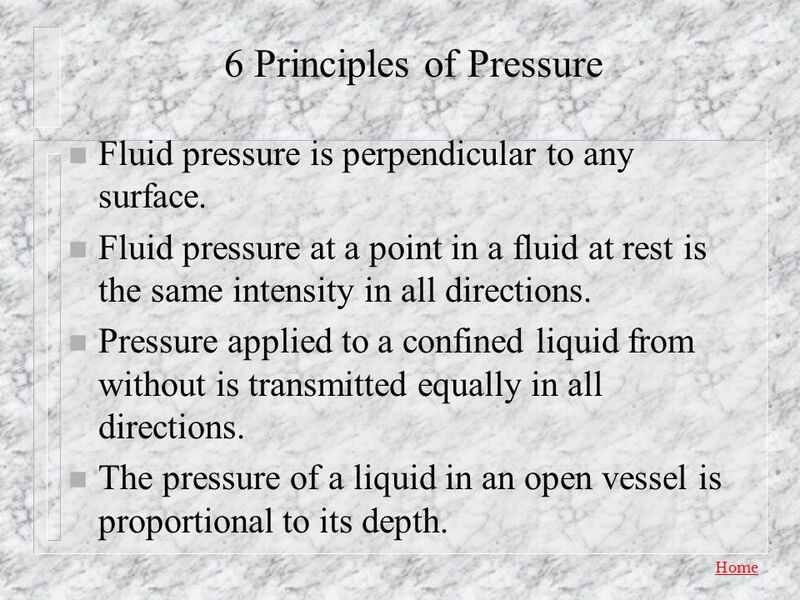 Fluid pressure at a point in a fluid at rest is the same intensity in all directions. 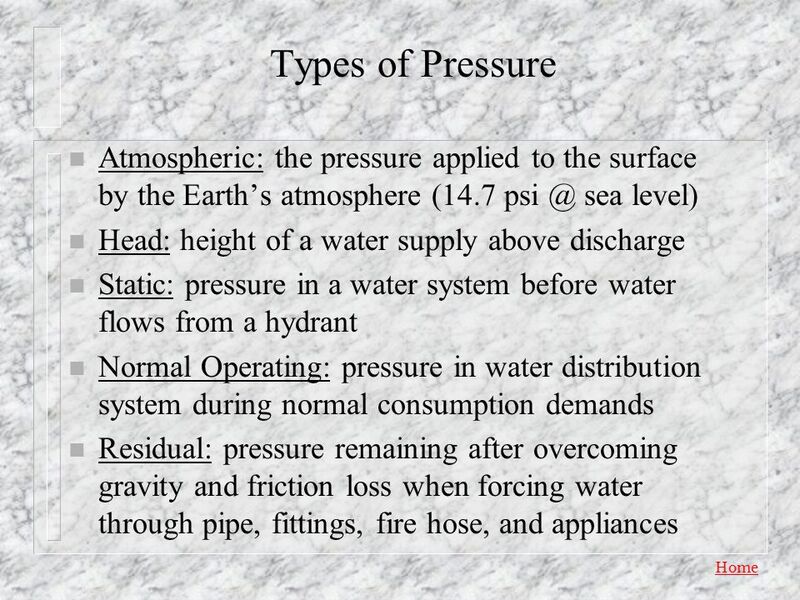 Pressure applied to a confined liquid from without is transmitted equally in all directions. 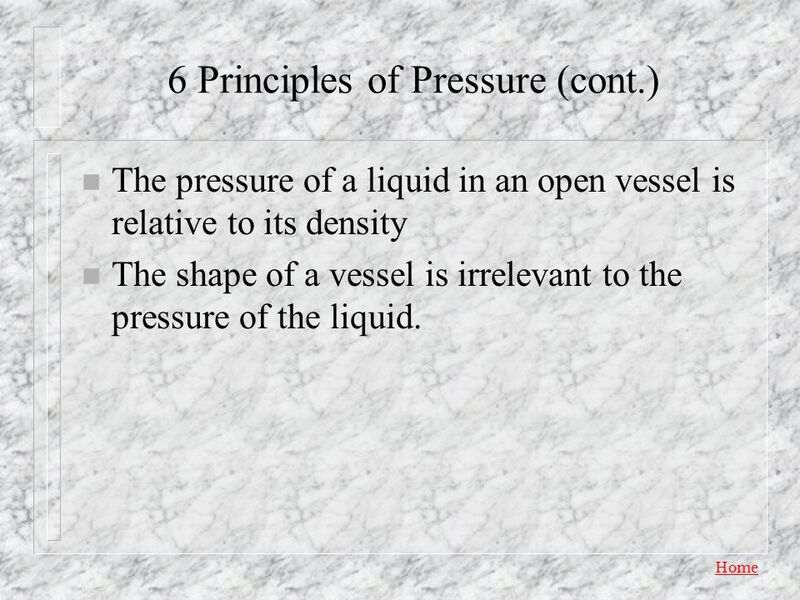 The pressure of a liquid in an open vessel is proportional to its depth. 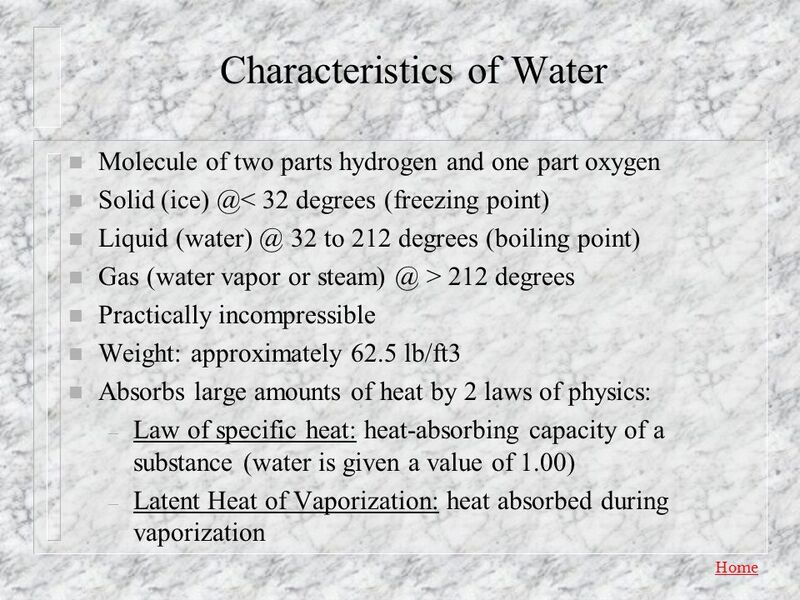 The pressure of a liquid in an open vessel is relative to its density The shape of a vessel is irrelevant to the pressure of the liquid. 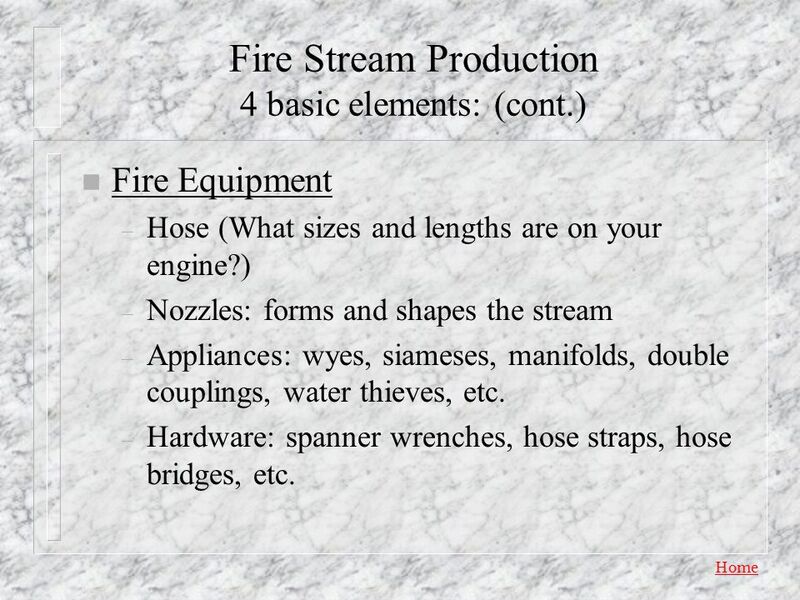 Fire Equipment Hose (What sizes and lengths are on your engine?) 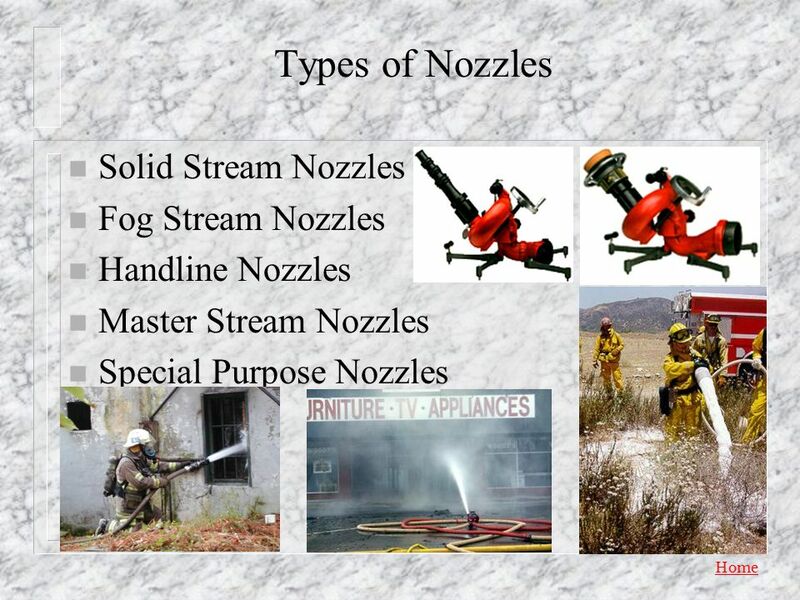 Nozzles: forms and shapes the stream Appliances: wyes, siameses, manifolds, double couplings, water thieves, etc. Hardware: spanner wrenches, hose straps, hose bridges, etc. 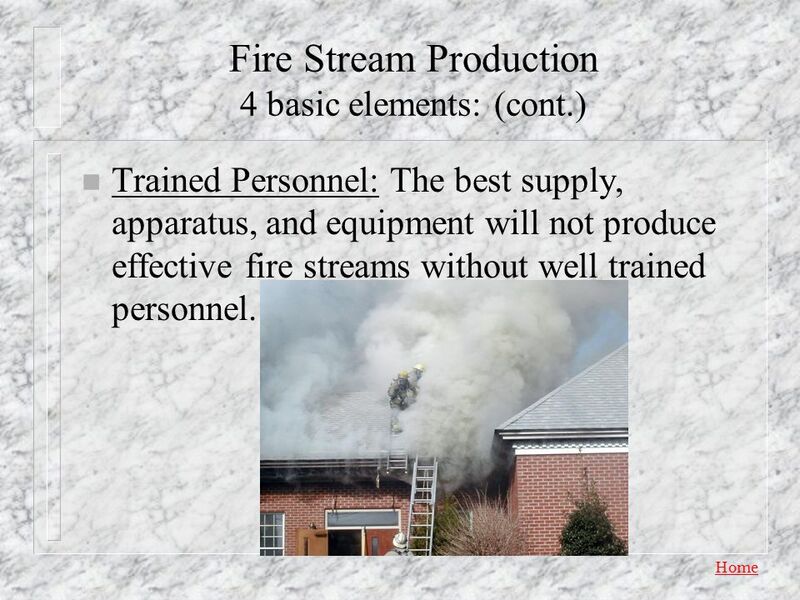 Trained Personnel: The best supply, apparatus, and equipment will not produce effective fire streams without well trained personnel. 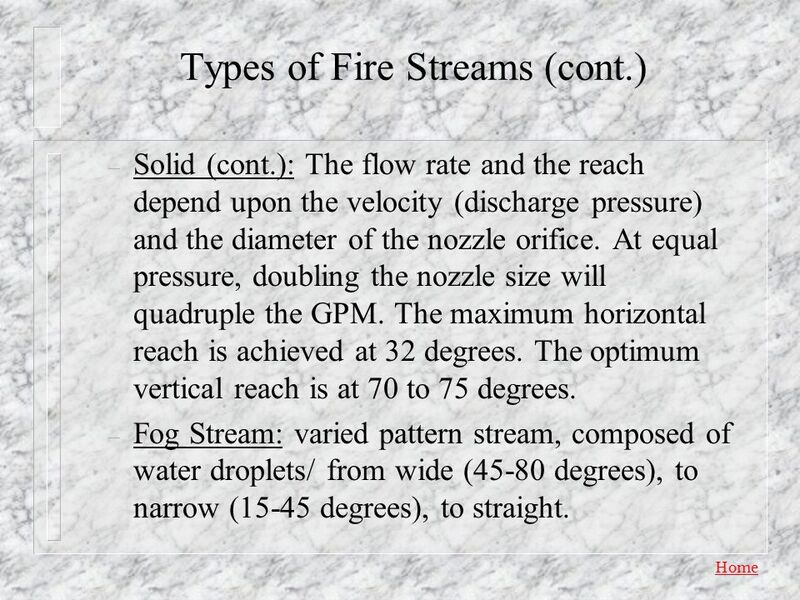 17 Sizes & Types of Fire Streams Fire Streams are identified by size and type. 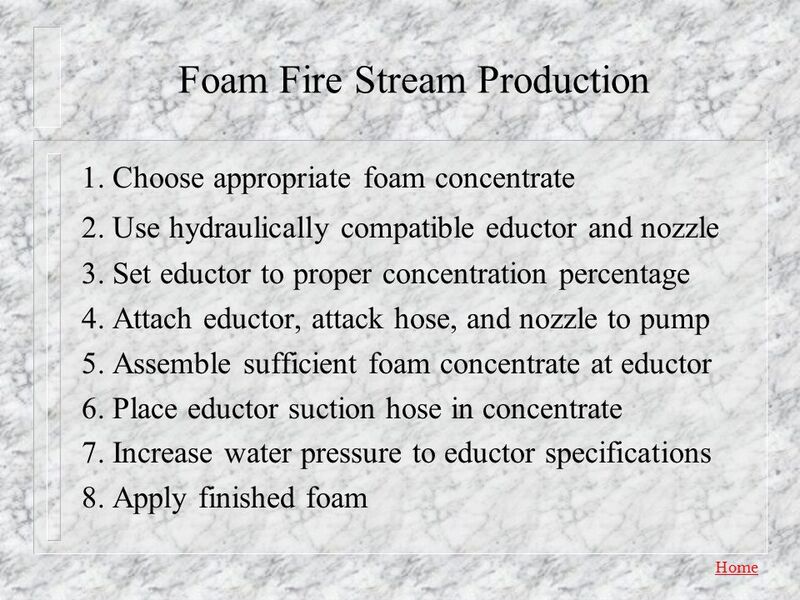 Size: stream volume in gallons per minute (GPM) Handline: 40 GPM to 350 GPM Master Stream: >350 GPM Type: stream shape or pattern Solid: Produced by a smoothbore, fixed-orifice nozzle (long range/ high volume). 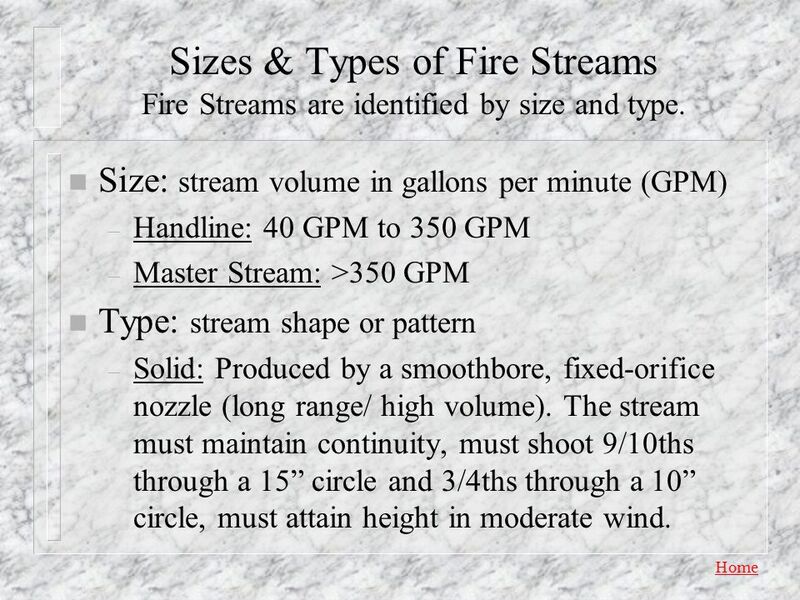 The stream must maintain continuity, must shoot 9/10ths through a 15” circle and 3/4ths through a 10” circle, must attain height in moderate wind. Solid (cont. 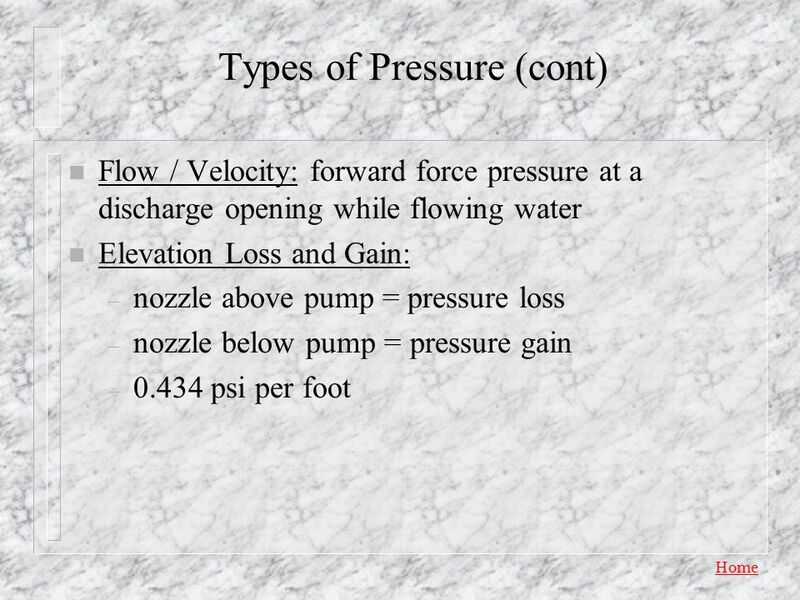 ): The flow rate and the reach depend upon the velocity (discharge pressure) and the diameter of the nozzle orifice. 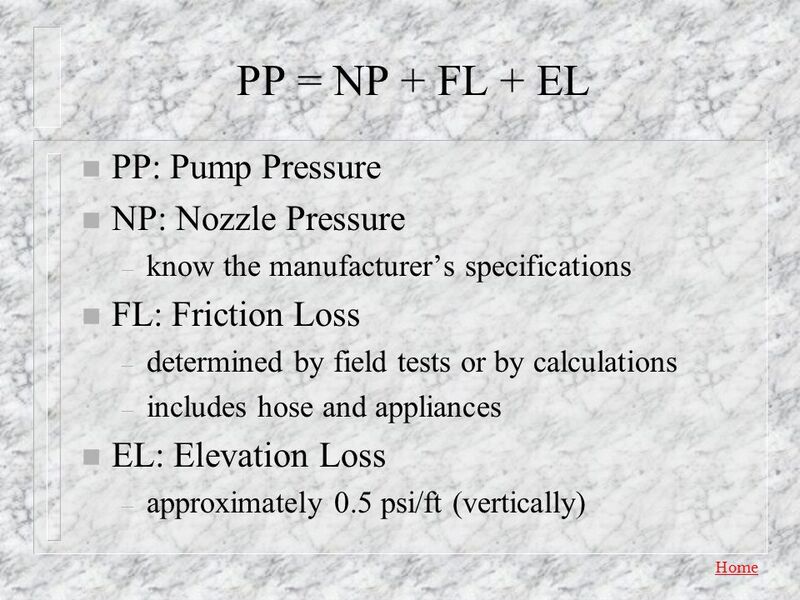 At equal pressure, doubling the nozzle size will quadruple the GPM. The maximum horizontal reach is achieved at 32 degrees. The optimum vertical reach is at 70 to 75 degrees. Fog Stream: varied pattern stream, composed of water droplets/ from wide (45-80 degrees), to narrow (15-45 degrees), to straight. 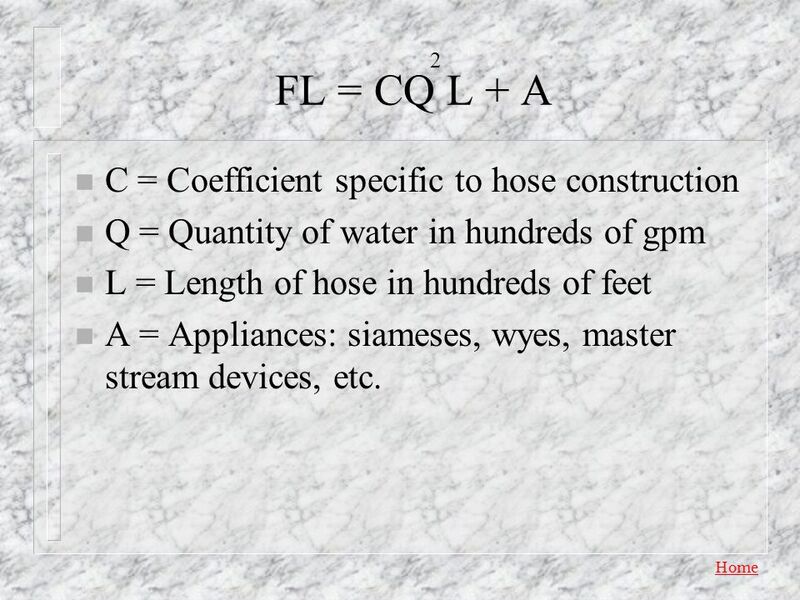 2 FL = CQ L + A C = Coefficient specific to hose construction Q = Quantity of water in hundreds of gpm L = Length of hose in hundreds of feet A = Appliances: siameses, wyes, master stream devices, etc. 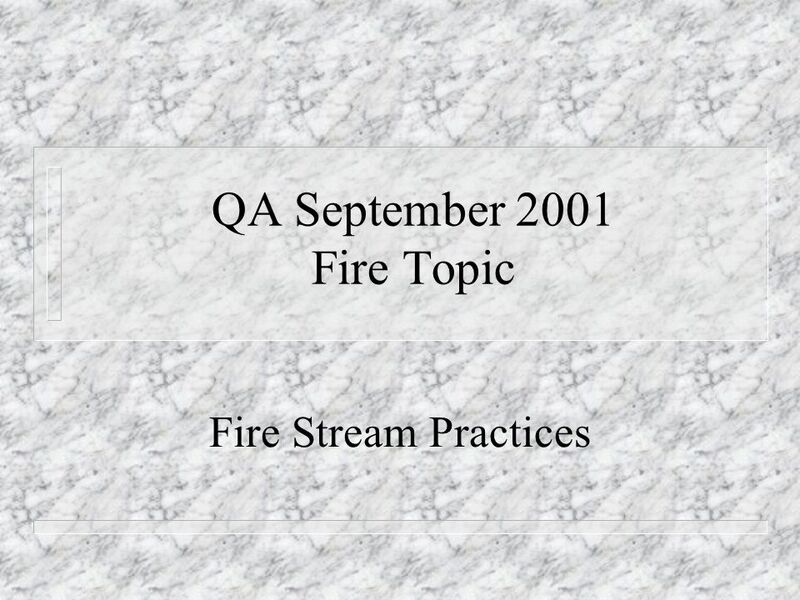 Download ppt "QA September 2001 Fire Topic"
$200 $300 $400 $500 $100 $200 $300 $400 $500 $100 $200 $300 $400 $500 $100 $200 $300 $400 $500 $100 $200 $300 $400 $500 $100 Tip SizesNozzlesPotpourriFormulas. 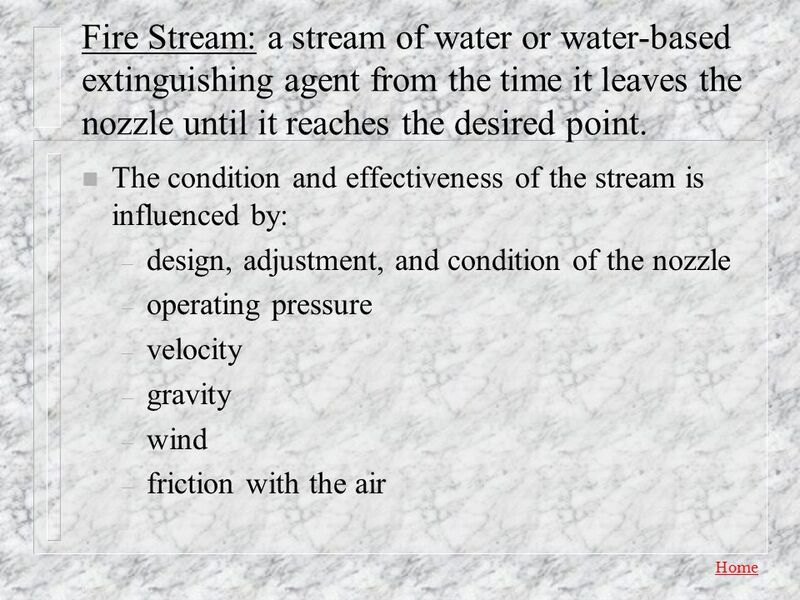 Chapter 14 Lesson Goal After completing this lesson, the student shall be able to effectively operate a solid stream nozzle, fog stream nozzle, and broken. 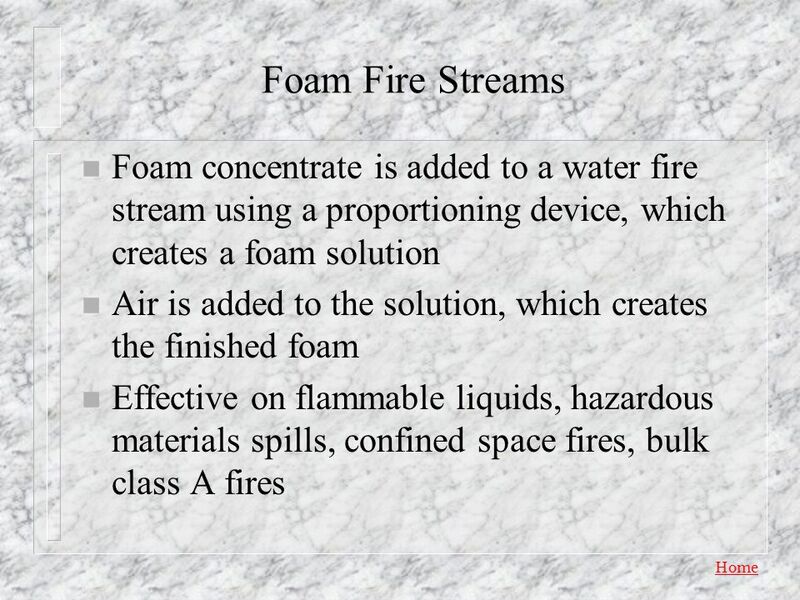 Master Streams. Master Stream Training Available...  Awareness and Operations Training  Portable Monitors  Offensive Strategies  Defensive Strategies. 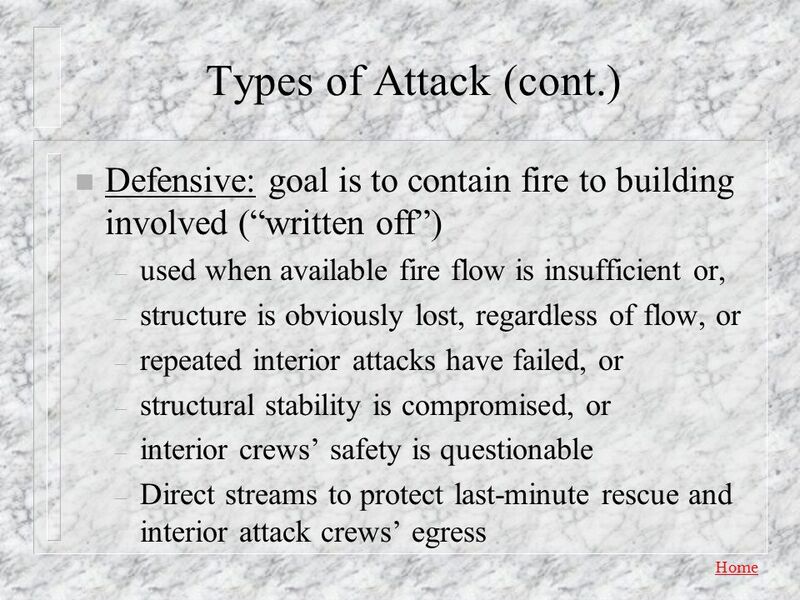 Adapted From Cody Fire School Presentations Amsterdam Fire Regular Fire Training February 16, 2009. 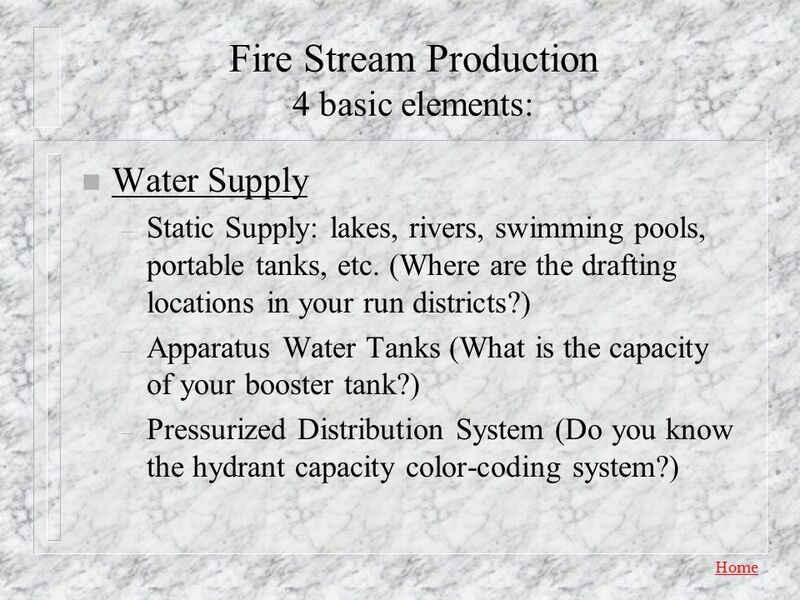 Fire Streams Geronimo Vol. 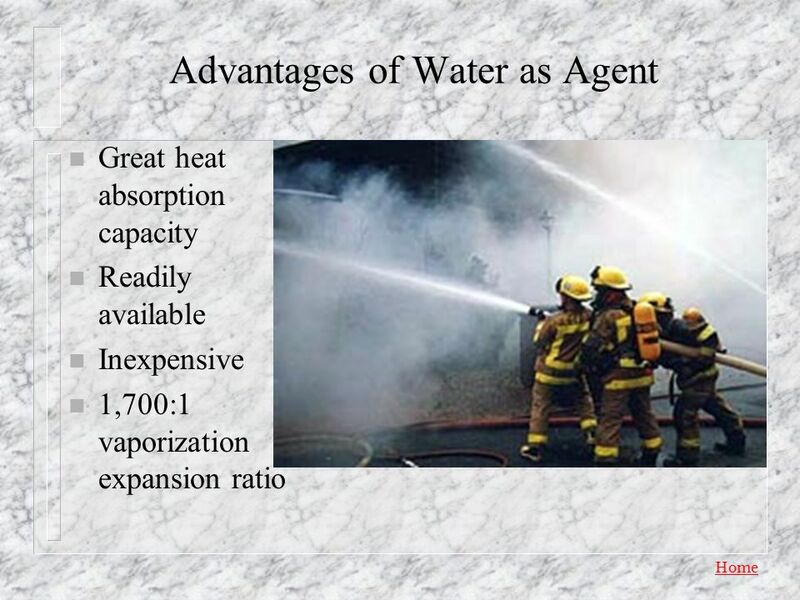 Fire Dept.. Extinguishing Properties of Water G Water extinguishes fires by G Cooling G Remove heat from the fire G Smothering. 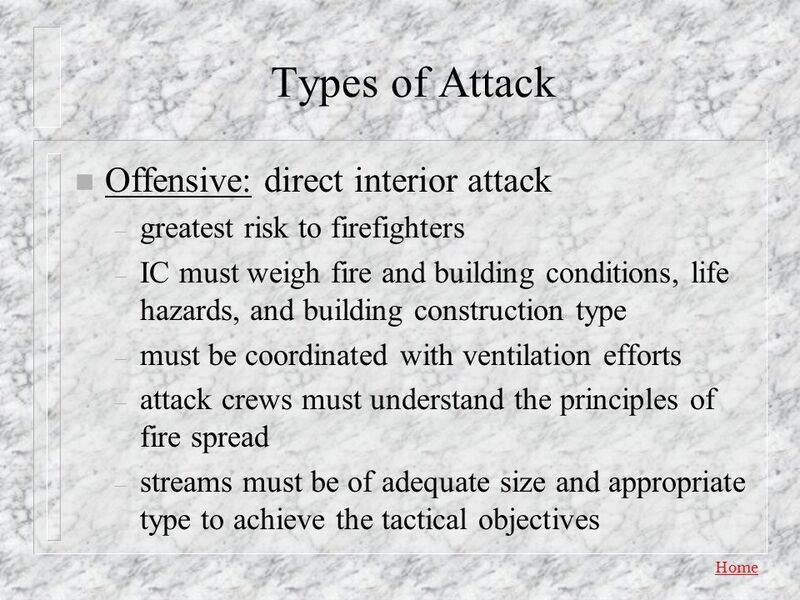 5/4/2015Dixon High School Fire Department1 Introduction The Recruit will also practice and masters certain skills and will be tested on these skills. At. 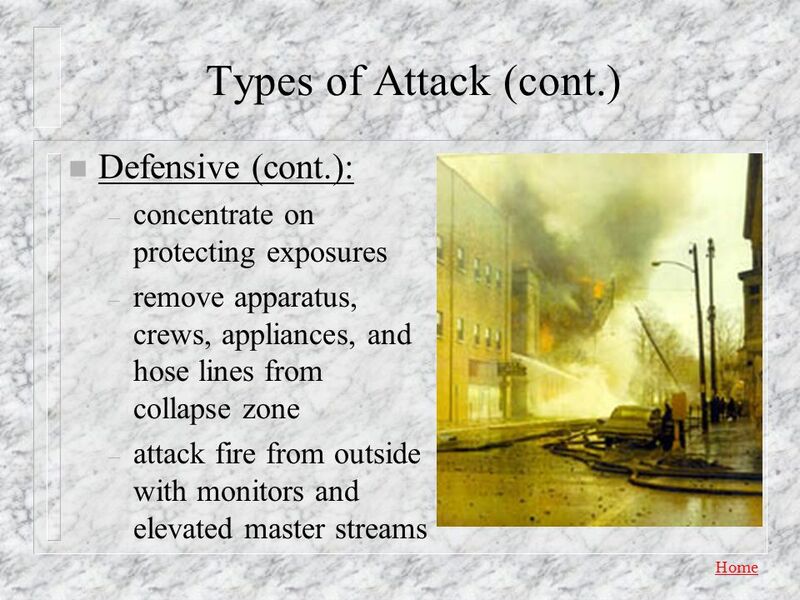 Nozzles and Fire Streams 1. 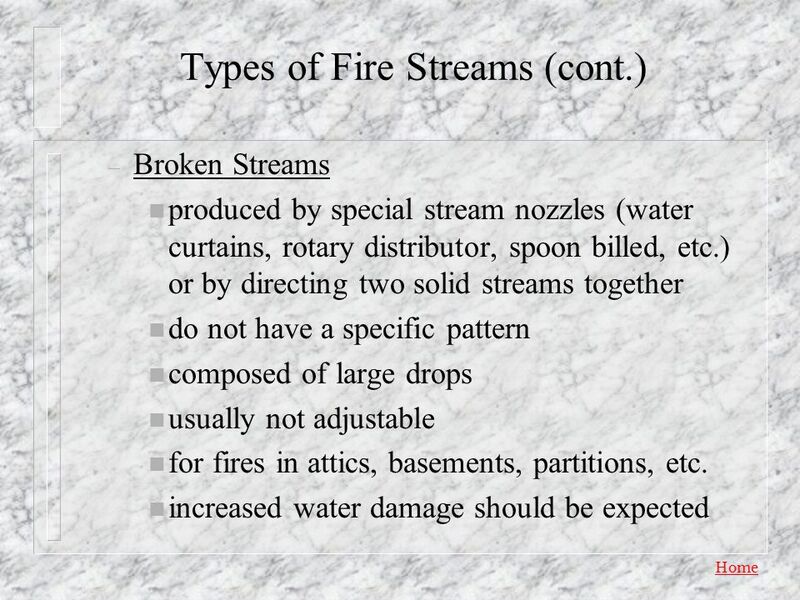 Introduction Fires usually extinguished by water Water delivered using nozzles and fire streams Nozzle selection important. 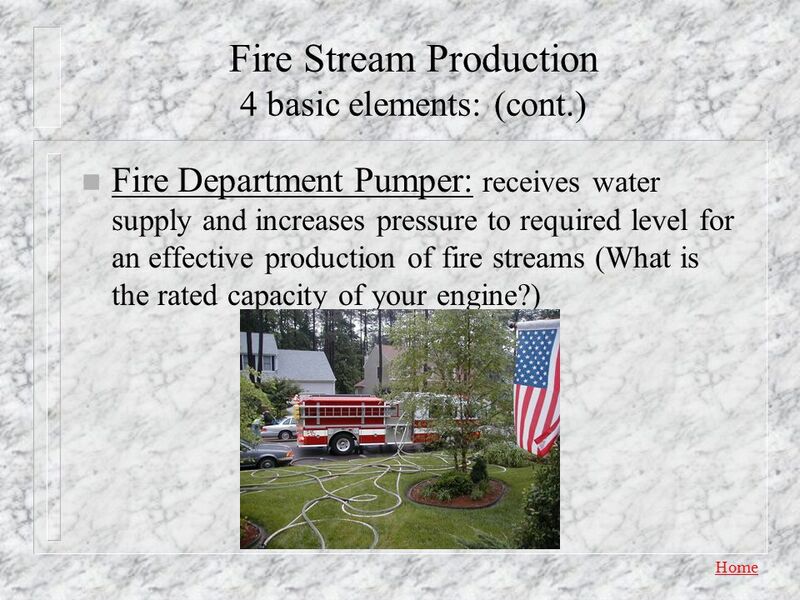 Service Delivery 3 Hydraulics. 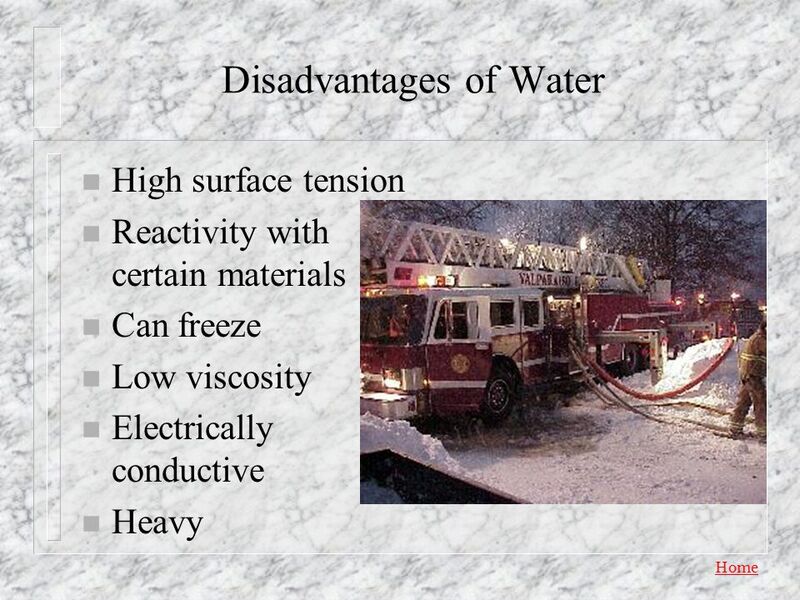 Aim To ensure students can explain the principles of obtaining and delivering water. 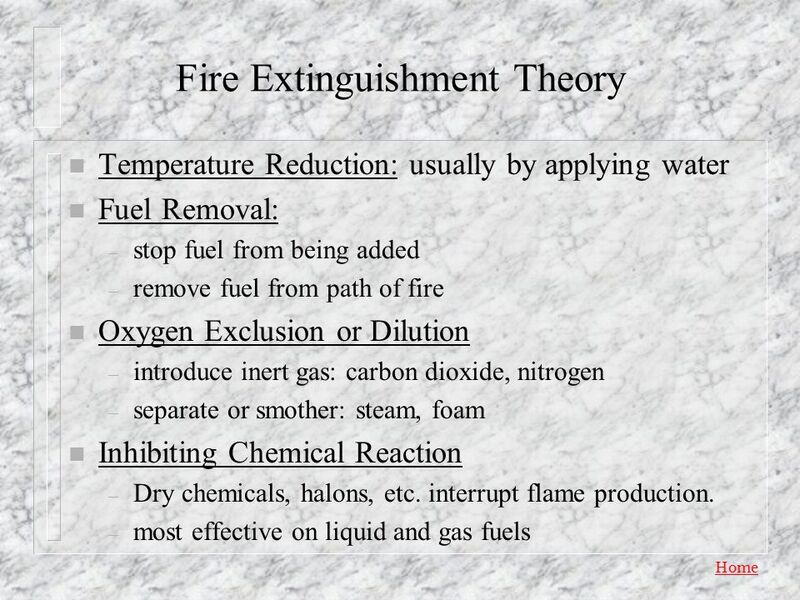 MODULE:3 FIRE CONFINMENT AND EXTINGUISHMENT. 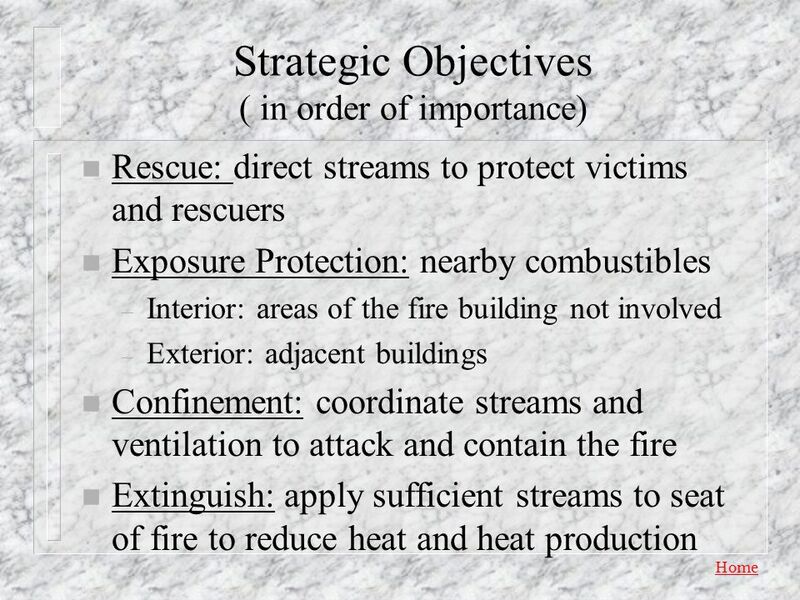 OBJECTIVES Module 3 Overview Select and deploy the appropriate hose lines to accomplish fire confinement.